Hey women…..fashion is not about rules, but about feeling beautiful and looking great in what we wear. So many times each of of us wonders ‘why does that outfit not look good on me, but on her?’. Don’t get into the rut that ‘Oh!!! I am so fat, I look ugly, I need to lose at least 20 lbs of weight…’ . Don’t find a reason to go into depression, simply understand women's clothing and restructure your wardrobe. Stylists and fashion gurus have broken down the most common body shapes and advise you to play upon the feature for a stylish beautiful you!! Wear apparels or dress that elongate your body. Wear tops that highlight the waist, deep embellished necklines, dramatic sleeves. Wear A line princess cuts or any garb that hit mid-thigh or below the knees for the slender look. A Fitting tops draw attention towards your waist. Go in for plunging V necks, bell sleeves, scoop necks or cowl necks. Wear dramatic neck accessories and earring. Well fitted clothes that celebrate your waist and highlight the neckline. Wear wrap tops, peplum blouses, form fitting blouses, a round neck, V neck or a boat neck. 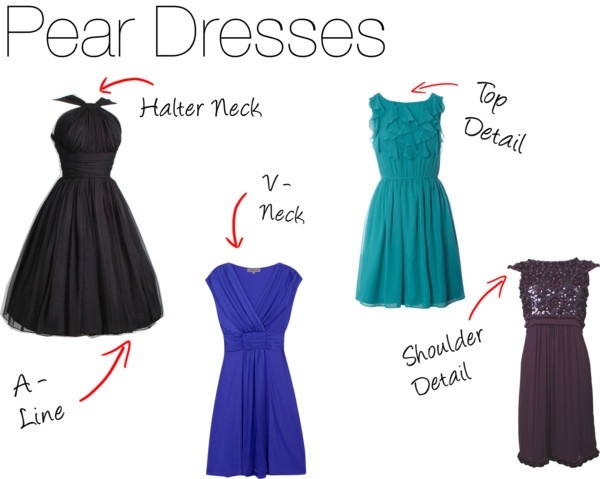 Elbow length, cap sleeves or flutter sleeves will draw attention to your waist. Stretch, skinny jeans, fit and flare dress and wrap around are made for hourglass figures. Apple Shape Body-A generally well proportioned body, with most of the weight through the mid section and bust, but may not be curvy at the hips. Flowy tunics, A line silhouettes, relaxed button ups or anything in V neck will look amazing on you. Select fabrics that streamline your look from bust to hips. Fitted sleeves or strap-less depends upon your preference. Pair your flowy tops with skinny jeans. Bracelets, rings, any accessory that is oversized to draw attention eye up. Athletic Body Shape- Your are not curvy, your hips and shoulders measure almost same and your weight iis almost evenly distributed. Draw attention to your well toned arms with halter or racerbacks, round or scoop necks or anything that will expose your shoulders. Belted tops will add curve to your waistline. Complement your top shape. Skinny jeans for oversized top. Accessorize where you want to draw the attention to!! Every body is different. If you think you have a mixed body style, then you can choose to dress and accessorize accordingly. There is no hard and fast rule, but simply a guideline by stylist. Mix and match and you will know what makes you look and feel good. Click here to find the stylish apparels and fashion accessories from Numph and Peaploves that is designed for all body shapes.